Worms have nothing whatsoever to do with this condition. ringworm is a shallow fungus infection of the skin. the designation "ringworm" derives from the characteristic red ring that appears on the skin. ringworm can generally be recognized by its pattern of development. the lesion begins with a small, round, red spots and get progressively larger. when they are about the size of a pea, the center begins to clear. when the lesions are about the size of a dime., they will have appearance of a ring. the border will be red, elevated and scaly. often there are groups of infections so close to one another that it is difficult to recognized them as individual rings. 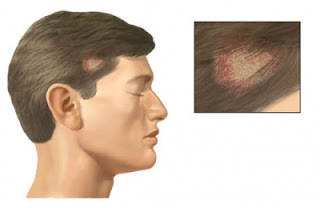 Ringworm may also affect the scalp or nails. these infections are more difficult to treat but, fortunately, are not seen very often. ringworm epidemics of the scalp were common many years ago. Tolnaftate (tinactin, etc. ), miconazole (micatin, etc.) and clotrimazole (lotrimin, etc.) applied to the skin are effective treatments for ringworm. they are available in cream, solution, and powder and can be purchased over-the-counter. either the cream ir the solution should applied two or three times a day. only a small amount is required for each application. selsun blue shampoo, applied as a cream several times a day, will often do the job and is less expensive. resolving this problem may take several weeks, but you should see improvement within one week. ringworm that either shows no improvement after a week of therapy or continues to spread should be checked by a doctor. Are all of the following conditions present? 1. rash begins as a small red, colorless, or depigmented circle that becomes progressively larger. 2. the circular border is elevated and perhaps scaly. 3. the center of the circle begins healing as the circle becomes larger. 1 comments for "Home Treatment For Ringworm"